During simultaneous interpreting contributions are communicated ?almost in real time?. This requires the highest level of attention and concentration and that is why at least 2 simultaneous interpreters usually work together in a soundproofed interpreting booth to relieve one another at regular intervals and provide mutual support. Areas of application: multi-lingual events, conferences, meetings, negotiations, shows, galas etc.. 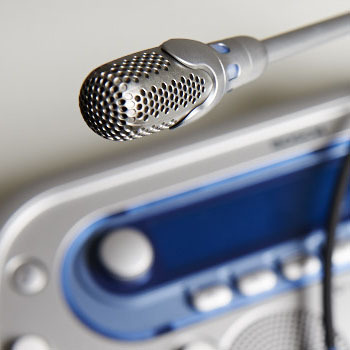 Simultaneous interpreting technology: all the technical equipment that is required to interpret at an event: soundproofed interpreting booth/s, interpreting desk, microphones, transmitters, receivers, headphones, cables etc. Many event venues have fixed interpreting booths. Mobile interpreting booths and the corresponding technical equipment can be rented from specialist conference technology providers. The interpreting consultant can provide recommendations or a list of competent providers. The consultant can contact the relevant companies on behalf of the client, hold the necessary consultations and collect offers. * Courtesy of the VKD im BDÜ e.V. Note: Synergy effects are possible here if the conference technology is booked with simultaneous interpreting technology from a single source. It is always worth asking!